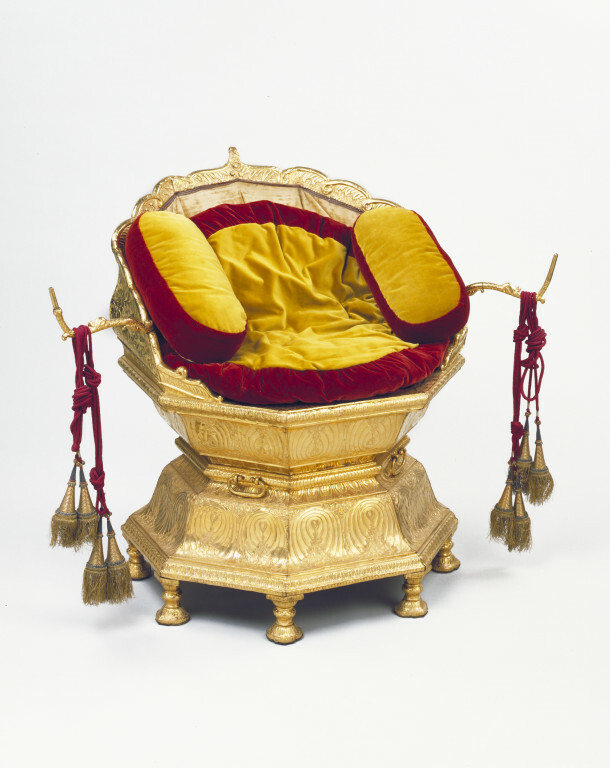 The goldsmith Hafez Muhammad Multani made this throne for Maharaja Ranjit Singh, probably between 1805 and 1810. It shows clearly the splendour of the maharaja's court. In Europe, royal furniture is usually simply gilded, which creates the effect of gold without incurring the cost. This throne is covered in thick sheet gold, heavily ornamented. The distinctive cusped base is composed of two tiers of lotus petals. The lotus is a symbol of purity and creation and has traditionally been used as a seat or throne for Hindu gods in sculpture, and in their depiction in painting. The lotus is also a metaphor of purity in Sikh scriptures. The contents of the Sikh treasury, including the throne, were taken by the British East India Company at their annexation of the Punjab in 1849. The jewellery and jewelled artefacts, silver furniture and courtly weapons were all auctioned in Lahore shortly after the annexation, but the throne was sent to London to be displayed in the museum of the East India Company in Leadenhall Street. When the museum's collections were dispersed in 1879, the throne was transferred to the South Kensington Museum, later renamed the Victoria and Albert Museum. Golden octagonal throne, of waisted shape, with 8 feet and handles at narrowest part. The throne has a raised, solid back, with supports on the left and right side, from which tassles hang. The seat contains gold and red cushions (the present fabric dates from the late 1980s) and overall the gold is embossed with floral and scrolling ornamentation. 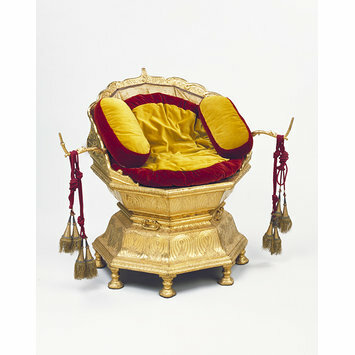 The throne was made for Maharaja Ranjit Singh (r. 1801-1839), and inherited by his descendants. It was taken by the British at the annexation of the Punjab in 1849, with the rest of the contents of the Sikh state treasury. Every item was inventoried at the time under the supervision of Dr John Login, who recorded the information supplied by the treasurer, Misr Makraj. This included the information that the throne was made by Hafez Muhammad Multani, but not the date of its creation. Most of the contents of the treasury were auctioned shortly afterwards, in Lahore. The throne was retained: the British Governor-General, Lord Dalhousie, was not sure if the throne should be sent to Britain, and wrote to the Court of Directors of the East India Company in London: 'It is set apart as an object which the court would probably desire to preserve, but as it is bulky, I shall not forward it until I receive orders to do so'. The Company did wish to preserve it, and in 1853 the throne travelled to Calcutta (where Dalhousie had a wooden replica made) before being shipped to the Indian Museum in London. In 1879, Ranjit Singh's Golden Throne moved to the South Kensington Museum, later renamed the Victoria and Albert Museum, where it has remained ever since. Thrones were portable objects used in camp as well as in court. The waisted shape suggests the lotus seats of Hindu/Buddhist/Sikh iconography. Maharaja Ranjit Singh's throne, made by Hafiz Muhammad Multani, c.1805-10. Davis, Richard. The Lives of Indian Images. Princeton, New Jersey: Princeton University Press, 1997, fig 30 p. 175, and pp 174-5. Stronge, Susan. The Arts of the Sikh Kingdoms. London: V&A publication, 1999, p.82, fig 90. Stronge, Susan 'The Sikh Treasury. The Sikh kingdom and the British Raj' in Kerry Brown, ed., Sikh Art and Literature, Routledge, London and New York, 1999, pp. 72-88. Jackson, Anna and Jaffer, Amin (eds), with Deepika Ahlawat. Maharaja : the splendour of India's royal courts. London, V&A Publishing, 2009. ISBN.9781851775736 (hbk. ), ISBN.1851775730 (hbk.). Jackson, Anna and Ji Wei (eds.) with Rosemary Crill, Ainsley M. Cameron and Nicholas Barnard, compiled by the Palace Museum, translated by Yuan Hong, Qi Yue and Liu Ran. The Splendour of India' Royal Courts : Collection of the Victoria and Albert Museum. Beijing: the Forbidden City Publishing House, 2013. Text in English and Chinese. ISBN 9787513403917. Swallow, Deborah: Arts of Asia, vol. 45, no. 5, September - October 2015, " 25 Years of the Nehru Gallery of Indian Art and the Nehru Trust", p. 93, no. 7.